When you are creating a story in the app, you can add different types of media, such as photos, videos and voice recordings. You can choose to add photos or videos that you have already taken, or you can take a photo, video or voice recording on the spot. Voice recordings only have the option to be recorded on the spot. If you have a video or photo already taken that you wish to use, select the "Choose Video" or "Choose Photo" option. 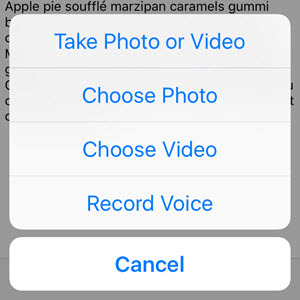 If you wish to take a new video or photo, select the "Take Photo" or "Video option." To record a voice recording, select the "Record Voice" option. To chose between photo or video, simply move the slider, as circled in orange below. 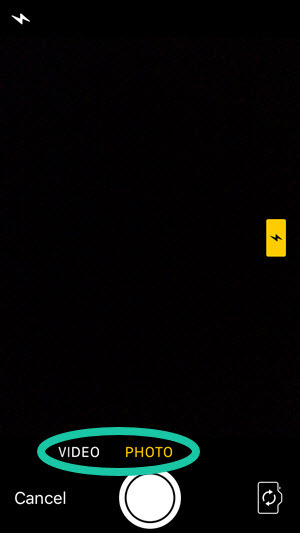 As shown in the image below, Photo mode is selected. Rotate the camera to take the video or photo horizontally or vertically. Please note: if the video is not horizontal it may not play properly in some browsers. Taking your video horizontally also ensures that it can be viewed optimally in full-screen mode. To record a voice memo, press the red button in the middle of the screen to begin the recording. You will see that the red button has changed into a stop button and that the elapsed time of the recording is displayed above it. To stop the recording, press the red stop button. This voice recording will be placed into your story. To preview the voice recording before posting, tap the attachment to listen. To upload a video or a photo that has already been taken, you will need to grant Educa access to your Photos. You may receive a pop-up message, simply tap "OK" to give Educa access.